Some veterinarians condemn the procedures shown in the video, which are both legal and accepted industry practices - including in so-called free-range operations - and approved by the American Veterinary Medical Association. The "food units" cascading down the conveyor in the video are sorted like apples, fine grade, rejects. Except that the kinetic yellow balls - an undulating fuzzy mass - are not pears or peppers, but newborn chicks. And they're being sorted into male, female and deformed - with male and deformed destined for death. A video just released by Mercy For Animals from Hy-Line Hatchery in Spencer, Iowa, the largest hatchery for egg-laying breed chicks in the US, confirms what has been rumored for years about the egg industry: that newborn males, which are worthless to the industry, are ground up alive in chopping machines called macerators. Video from a hidden camera clearly shows healthy male chicks, peeping and bouncing as they greet the world, fed into the blades of the macerator like so much litter. Hello! Goodbye! "I saw a bloody slush coming out of the bottom of the grinder," writes the MFA investigator, who worked in the Hy-Line "transfer room" and on the cleaning crew during May and June. "The plant manager told me that the ground-up male chicks were used in dog food and fertilizer." Also shown in the Mercy For Animals video is the debeaking procedure in which chicks are inserted en masse into a laser cutter where they dangle by their beaks, struggling, while burns are inflicted that make part of their beak fall off in a week. Nor does the egg industry want to waste any time letting a chick peck its way out of its shell to start its tour of duty on the egg farm, if it's female. The hatchery's "separator" machine efficiently disconnects newborns from their shells at the price of the few, which fall to the ground or get caught in the machine and "washed" along with the equipment. Asked about the panting, damp newborns on the floor, half born and half dead, a worker tells the MFA investigator, "Some of them get on the floor and get wet and then they're no good." Like veal calves on dairy farms, egg industry chicks experience no moments with their mothers despite their innate biological urges. Their first memories will be of blades, pain and terror, not of a mother in the mechanized hell the egg industry has devised to bring cheap product to the market. "Intense pain, shock and bleeding result" from debeaking - which is done to offset the effects of crowding - and "some chicks may die outright in the process," says Nedim C. Buyukmihci, V.M.D., emeritus professor of Veterinary Medicine at the University of California, who has specialized in farmed animals and chickens. "There is loss of weight because the chicks are too painful or disfigured to eat properly, sometimes because the tongue is injured or severed during the process." Illinois veterinarian Debra Teachout agrees. The beak is a "sensory organ" necessary not just for grasping food, but for "preening, drinking, manipulating objects in the environment, nest building and defense," says Dr. Teachout. "As a practicing veterinarian, if I were treating a pet chicken of the same age that required a similar surgical procedure on its beak for therapeutic reasons, and I did not use anesthetics followed by pain modulation, it would be considered malpractice." And maceration? A fate which greets 150,000 baby males a day at the hatchery according to the MFA investigator? To render chicks "into pink mush" even as they "bounce and vocalize" cannot be termed euthanasia, says Dr. Teachout, because that term implies a "good death." The US trade group United Egg Producers confirms the daily maceration of thousands of chicks depicted by the video. It's just the price we pay for cheap eggs, said spokesman Mitch Head to The Associated Press. "There is, unfortunately, no way to breed eggs that only produce female hens. If someone has a need for 200 million male chicks, we're happy to provide them to anyone who wants them. But we can find no market, no need." But at simultaneous press conferences this week in Spencer, Des Moines and Davenport, Iowa, where the video was presented, Mercy For Animals contended that many consumers would reject such cruelty if they knew about it. 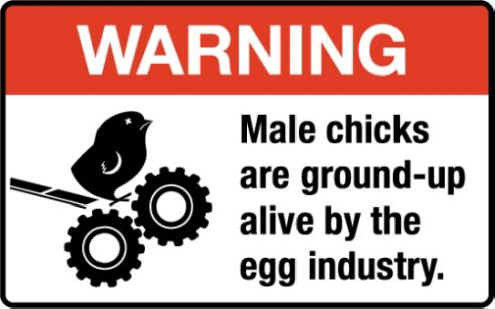 The Chicago-based group is calling on Wal-Mart, Kroger, Safeway and 47 other grocery chains to affix a new label to egg cartons that says, "Warning: Male chicks are ground-up alive by the egg industry," depicting a chick atop grinding blades. "The vast majority of Americans care deeply about farmed animal welfare issues, yet, they're kept in the dark about the egg industry's painful disposal of male chicks," says Nathan Runkle, MFA executive director. "If egg producers threw, mutilated and ground up puppies or kittens, they'd be prosecuted for cruelty to animals!" Grocery stores and consumers have an obligation to acknowledge the truth about eggs, says Runkle, especially when there are so many "easy and delicious" alternatives. "Compassionate consumers can find an assortment of mouthwatering, egg-free recipes at ChooseVeg.com," he says.